Her love for photography sprouted among the flowers and trees at the Englewood MetroPark, where as a young girl she would hike for hours after school and capture nature on film. That led Chelsea Hall to Wright State University, where she earned her degree in mass communication with a focus on photojournalism. Along the way she worked at The Guardian student newspaper, taking photos of everyone from Vice President Joe Biden to pop superstar Kesha to the athletes of Wright State. Today, Hall runs Chelsea Hall Photography, a growing Dayton business that specializes in wedding photography and portraits. 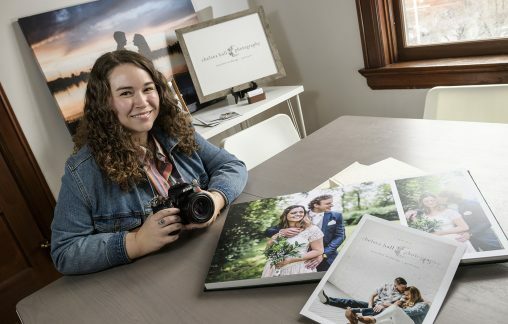 She was voted best local photographer in the Best of Dayton 2018 contest, besting a half dozen other nominees. The honor brought Hall to tears, who called it a “big win” for her team and the clients she has photographed. “I think winning Best of Dayton definitely validates our work,” she said. Hall’s love of photography developed at a young age. When she was 8, she would walk around with a disposable camera. She staged photos of her teddy bears and loved to play Pokémon Snap, a video game in which players take pictures of Pokémon and are rated on them. Hall’s family and their vacations were popular photo subjects. And hikes in the 1,900-acre Englewood park with its forests, wetlands and waterfalls stoked Hall’s dreams of someday being a photographer for National Geographic magazine. After graduating from Northmont High School in 2009, she enrolled at Wright State to pursue photography. Her grandparents had given her a new DSLR digital camera, which she used to take photos for The Guardian as a volunteer before she was promoted to chief photographer and then editor-in-chief. Hall was also in the Delta Zeta sorority, worked as a resident assistant in Hamilton Hall for two years and was social media coordinator for Residence Life and Housing her senior year. After graduating in 2013 with a bachelor’s degree, Hall began concentrating on that business. Hall started the business on her own, but she now has an associate photographer and an office assistant. She is a co-leader for Tuesdays Together, a group that meets to discuss business topics and foster community among entrepreneurs in the Dayton area. Hall takes a photojournalistic approach to photographing weddings, quietly looking for those special spontaneous moments instead of trying to stage shoots. Hall says weddings can be a bit of a blur for both the participants and the photographer. Hall said knowing that her clients have photos to enjoy for the rest of their lives is “super exciting” for her. “It’s really cool to leave a legacy for my clients and their children and their children’s children,” she said. Hall also does non-wedding photography, shooting couples during special life moments such as engagements and births. For Hall, chronicling a wedding on camera is a deeply moving experience.